There's a rumor going around today to the effect that Apple could embed an E-ink screen behind/underneath the keyboard of future Macbooks. Apple is rumored to be holding a press event before the end of this month where it will show off its new line of MacBook Pros. The refreshed laptops will reportedly feature an OLED touch display above the keyboard that changes depending on which application the user has open. Now, it’s been revealed that a similar system could be implemented into an entire Apple keyboard. Reddit user Foxconninsider, who works at Tsinghua University (“like the Chinese MIT”), said such a keyboard was on show at a recent closed-doors event on campus, hosted by Apple supplier Foxconn. Australian startup Sonder was present at the event, showing off a prototype next generation Apple Magic Keyboard that features an E-Ink display on every key. These can change depending on a user’s needs, bringing up different languages, images, and shortcuts. The device could also have many applications when if comes to gaming, especially with titles that use a lot of keys, such as Elite: Dangerous. Of course we should wait for a leaked component, spec, or other concrete info before putting any weight in the story, but it would be pretty cool if this rumor comes true. 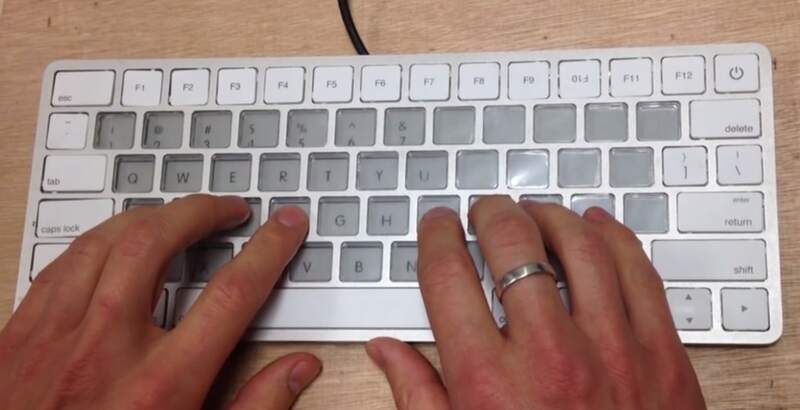 As you can see in the following video, putting an E-ink screen behind a keyboard gives users the option of quickly switching between custom keyboards. That looks nifty, but it is hard to say whether it will be very useful. Does anyone really need to change the keyboard that often? And would they need the keys labeled, rather than having memorized the key positions? First, is there an eink panel that would fit a keyboard? Second, the idea is hardly new: Acer had a dual screen laptop back in 2010 where the second screen could be a keyboard, trakpad, or a digitizer. Third, the idea can be very useful in Asia where a dynamic keyboard would be useful for speeding up entry in non-roman scripts. The video shows a screen; I’d say that is a good sign it fits and exists. In Europe a lot of people switch keyboards on their phone. Once I got the facility with an iPad I nearly stopped using my PC. I am French living in Sweden(Swedish keyboard with åöä) using english daily…. So I would definitely consider buying such a keyboard. A lot of countries in Europe Africa Asia have several languages. It will be very useful for polyglots. I write emails regularly in English, Japanese, French and Chinese and find it a pain to switch keyboards on a regular computer. This is the reason why I use a tablet for my emails using the multilingual keyboard.